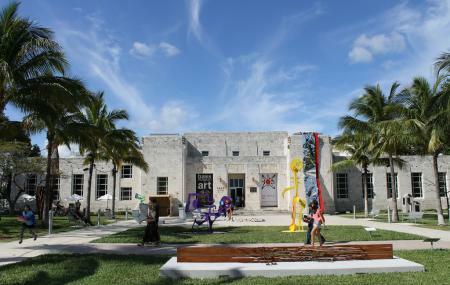 The Bass Museum of Art houses installations of the Renaissance period and contemporary art. The Museum hosts several permanent and travelling exhibits. They also have lectures, concerts and educational programs. This is an ideal place to visit for those who are enthusiastic about art but not experts on the subject. There is also a gift shop within the museum, which is a branch of the popular store Elemental. Also, visit nearby attractions which are covered in Miami itinerary 3 days. Docent tours by appointment. Free with museum admission. Bus Stop: Collins Av@21 St.
Love this? Explore the entire list of places to visit in Miami before you plan your trip. Fancy a good night's sleep after a tiring day? Check out where to stay in Miami and book an accommodation of your choice. How popular is Bass Museum Of Art? People normally club together HistoryMiami and Pubbelly Gastropub while planning their visit to Bass Museum Of Art. People also prefer to start their day with Bass Museum Of Art. This is a great museum. The day we went it happened to be free, but we would have happily paid. There were a lot of very interesting and unusual exhibits. I'm surprised they let people climb on the giant bed, definitely try it if you go! For those saying it's too short or not worth the money, I would say they are not giving the exhibits due consideration. Many of them clearly took a great deal of time, creativity and craftsmanship by the artists. Well worth a visit. I came here with my family. Right when we walked in we got welcomed from the employees. Very nice and friendly. She also explained to me that if you live in south beach you get free entry. The museum usually costs 10$ per person so that was awesome. The museum is super clean and is very easy to walk around. Usually it's not that packed unless they have something going on like art basel or other big events. They do have two floors, sadly have of the first floor was closed when we were there. They do, from my understanding change it up once in a while so they are able to represent different artists. Which makes you wanna come more often. There is also a gift shop with a little cafe in there which pretty much rounds the whole place up. You can take pictures which also makes it a little more fun. All in all it's worth going by either way. Cool little museum with friendly staff. You can get in at half price if you have your student ID with you. The exhibits seem to change from year to year to keep things fresh. Cool way to spend an hour down in Miami Beach. I'm sorry, except for a few cool art works here, most of them honestly looked like trash. I am happy I was able to get half off with my student discount.